It’s the holidays, so we’re going to keep it a little more lighthearted with this month’s Positive Pet Training Hop, and our theme “Your dog’s good points and bad points, and how you’re working on improving them.” I’m going to select each of my dog’s worst habits and best traits, and they are illustrating (as best we could) while wearing their “Naughty/Nice” Christmas bandanas (the bandana folds so one word or the other is seen). The truth is, when selecting what I might think is their worst behavior, I realized that we mostly don’t work on improving those particular things. We accept some things as part of their personalities. Luke has a lot of issues we are constantly working on (not necessarily naughty, but sometimes just frustrating behaviors arising from his fears), and sometimes we just need to choose our battles. Cricket is mostly very well behaved, she is 13 years old, and a stubborn beagle, so by now there are some things we have just accepted about her. One of Luke’s bad habits that is most challenging for us has nothing to do with his fears. He is an unrepentant counter surfer. Other than saying “no”, “get down” or “off”, we have not found any way to stop him from doing this, and even those words don’t often work if there’s something he really wants. I believe this is called “self-rewarding behavior”, which seems apt. The only way we can deal with this is management and that means we simply cannot leave food unattended, on the counter or anywhere else. Every time I bring eggs in from the coop, Luke has to see them. Maybe he’s counting to see how many we got that day? On the long list of things I need to work on with Luke, right now, managing this one is easier. I also haven’t found the answer of exactly how to train him not to do this. Although training myself to stop leaving food unattended, when I’m easily distracted, hasn’t exactly been easy either! Now, Cricket would disagree with us that this is Luke’s naughtiest behavior. She finds it far more annoying when he keeps her ball away from her (plus sometimes she’s standing by egging him on when something comes off the counter…..like the chicken breast he stole once). Luke’s intelligence and willingness to learn are strong points for him, and he is such a good model for photographs for the blog! But by far my favorite thing about him is how loving he is, how he wants to be by my side (it means so much to me that he follows me around the house like our late beagle Kobi used to do), and how he loves to snuggle. Cricket really is a good girl, and it was more difficult to come up with something for her. If you’re a regular reader of this blog, this won’t be the first time that you’ve seen photos of her barking at me when she wants me to throw the ball! I used to try to get her to stop, by not throwing it until she stopped barking, but honestly, she can outdo me in the stubbornness department every time. I gave up, and since to me it’s harmless behavior (other than when she lets out one of those high-pitched barks right in my ear when I’m bending over! ), I have let it go. I’m just so happy that she’s still this excited about playing ball, when she is 13 years old, and has arthritis and a heart condition. We are going to do everything we can to make her happy! Well, she’s just so sweet and happy. She spends a lot of time napping, and she looks adorable when she is (and it’s so cute when she snores)! She brings a smile to my face every day, whether she’s quietly napping or merrily dancing around the house waiting for her treat when we come home. I also cherish those moments when the two of them are this nice together. They have their times when they argue over space or attention, so it’s extra special when they get along so nicely. I think they must know Santa is coming, because I did not set up these photos of them together on the couch, they did it all on their own….that’s especially nice. 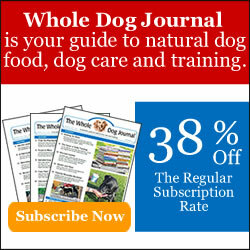 Do you let any of your dogs’ naughty behaviors slide sometimes? We are pleased to be co-hosting the Positive Pet Training blog hop with Tenacious Little Terrier and Travels with Barley. Pet bloggers, please join us in this hop by posting your positive pet training stories. The hop remains open through Sunday. Our theme this month is “Naughty & Nice”, however, you may share any positive pet training story, whether it’s on our theme or not! Impulse Control – What Does it Mean for Your Dog? What to Do, What to Do, When Your Dog Won’t Listen to You? Counter-surfing is a behavior we haven’t been able to train her out of. So we’ve learned that management is key, and I really feel like that is ok. I think we sometimes just have to focus on the good things they do, and reward for that. I love the photos, they look so sweet. I think management can be OK too. Sometimes I feel like you just have to let your dog express their personality, and not try to train it all out of them! I think the only positive way to train not to counter surf would be to give them something so much more valuable on the ground level. So yeah, management is our best move. Yesterday I got up to turn the Christmas lights on and turned around to see Leo licking my dinner. You might be right about that! They do get their eggs, and they love them! Oh boy. Management is sometimes the only thing that gets us through the day 🙂 Barley is terrible at counter surfing. Rye does pretty well when I say off, but the only way to get Barley off the counter is to physically remove her, so it’s a lot easier to just keep it from happening in the first place. Mr. N can be leash reactive to dogs and has separation anxiety but he has pretty good house manners. If I caught him counter surfing, I would be both very impressed and bemused! If he really wanted to, I could see him climbing up on chairs and tables to reach the counter! Now that’s a good point! I used to be obsessively neat, but that has declined as I’ve gotten older. I’m glad to have Luke to keep me motivated! That’s one of the few joys of having our pets get older – they often behave better! I totally agree, as long as it’s not hurting them, then why not let them have a little fun? We haven’t had a lot of naughty cats, though Sam’s sister Katie did like to steal dog treats off the counter, and she was known for getting into a lot of things. I think that they are both very very nice! I agree with you about not freaking out about things that are going to be very hard to change like Cricket’s barking. R barks that same way, and I just try to smile while appreciating his amazing exuberance. R is also a counter surfer, and we use management, like you do. I think that the potential rewards (from his view point) far outweigh anything that we could give him for “leaving it”. Often I think some dogs just do certain things because it’s fun (or rewarding), and they certainly don’t consider the consequences. 🙂 It’s part of their sheer joie de vivre! We are so very lucky to have short dogs who can’t counter surf…but if you leave a chair out just a little bit, Jakey will hop up and check out what’s on the table(only when he thinks we have left the house tho…). He is our sneaky boy! That Jakey is a smart one! Sometimes Luke tries to be sneaky, but often he’ll do it right in front of us too! We have a counter surfer here too, but I won’t mention his name! Callie was our counter surfer. And if Ducky were tall enough, she’d be one too! Luckily, her legs are just a bit too short. Of course, no matter what you do to try to break them of the habit, it’s not going to work if other humans constantly sneak them a bite of food while standing at the counter or sitting at the table/food bar. (Ahem, Samuel!). Ducky has resource-guarding issues that I keep trying to work with her on, but it’s hard when you’re her favorite resource in a small house. Oh well, just have to keep working on that one. Shadow is always a nice girl. She hasn’t been naughty since Callie went to Heaven. She’s still happy and loves to play, but like Cricket, she’s 13 and has arthritis. So, she naps a lot. And sometimes – not often – I can get a photo of them sharing close quarters in the house or yard. I love the photos, what a great story each one tells. We have all adapted to the fact that Bailie enjoys being naughty but it isn’t hurting anyone, just a few pillow explosions or some stolen food now and then. She only does it for fun and Mom can’t win the battle, so naughty on! Good job counting eggs, Luke! I think it’s fun to just let dogs be dogs sometimes, as long as it’s nothing harmful. It’s part of the joy of having them!